Oriental Brewery, a unit of the world's largest beer maker, Anheuser-Busch InBev, has been increasing exports by over 10% every year since 2011. Oriental used to mainly make and export other companies' brands of beer. Today, it is exporting more of its own suds, such as Cass and Premier OB. Exports have grown thanks to the hit of South Korean TV drama "My Love from the Star." The series attracted many viewers across Asia and introduced the culture of enjoying beer with chicken, which boosted exports, an Oriental representative said. According to the Korea Customs Service, brewers exported $84.4 million worth of beer in 2015, up 16.9% from 2013. Between January and July, shipments rose 3.7% from the same period last year. Though relatively small in size, South Korea's beer market is showing remarkable growth as the country's overall exports slump due to stagnant shipping, steel and other heavy industries. 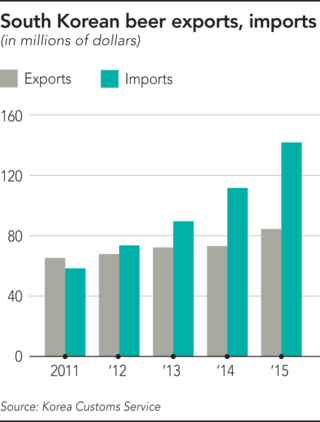 Hong Kong is the top importer of South Korean beer, accounting for about 40% of the total, partly because the region has no beer tariff. China, Iraq, Singapore, the U.S. and Japan follow in the ranking. 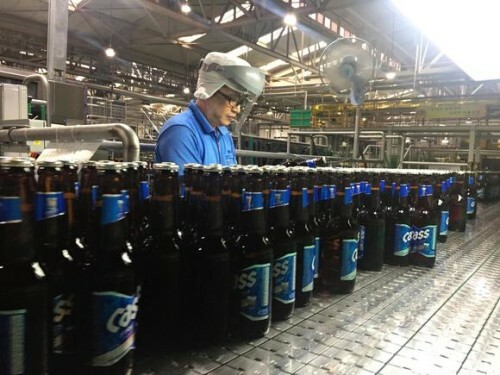 Malaysia, Vietnam and other Southeast Asian countries are importing more South Korean beer. In these countries, hallyu, or Korean wave, culture still has much appeal to consumers. Hitejinro, which sells Hite beer, considers these markets strategically important and has been riding the Korean wave to them. Hitejinro uses Ha Jung-woo, a popular South Korean actor, to promote its products. Hitejinro's exports to Southeast Asia rose more than fivefold to $7.61 million in 2015 compared to 2013. South Korean beer is known for having little body. A media says it is worse than beer made in North Korea. It is not alone in its dislike of the stuff. Most South Korean beer has low malt. In Japan, for instance, at least two-thirds of the content has to be malt for the product to be sold as beer. However, the bad reputation associated with South Korean beer has been more than offset by the Korean wave. Lotte Chilsung Beverage, which entered the domestic beer market in 2014 with Kloud, a full-malt beer, has been busy keeping up with rising demand at home. It is also eager to join the competition outside South Korea.